The purpose of the clinic is twofold. First is to help people who are new to cat sailing improve their rigging and sailing skill and second to get new people involved in the sport. To do this the clinic will have several aspects. Have experienced sailors take new people for rides. These are the basic ideas but we would like to solicit any other suggestions and ideas you might have. 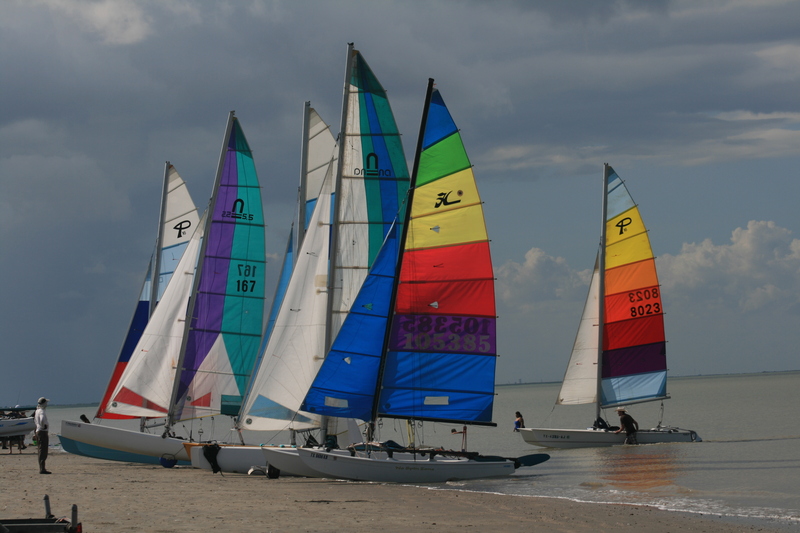 I ask all the TCDYC members to to talk the clinic up with anyone who might be interested in sailing. Tell them it is not necessary to have a boat. They can just come down for ride to see what it is like. The more people we get interested in the sport the better it will be for all of us. There will be a nominal fee of $10 dollars to cover the cost of the class. A registration form will be posted shortly. If you have not been to the dike there is a $5/car entry fee (covers you trailer) unless you are a Texas City resident. The clinic weekend is Cinco de Mayo so remember to get there early as it will be crowded. We will b setting up Friday evening. Any help in that regard will be greatly appreciated. I attended this clinic last year and it was a great refresher! If your like me you probably learned to sail from trial & error and things you have read in books or online, I can say Chris really does a great lecture on the beach he illustrates both on a white board and then walks over to a boat and shows you what he is talking about. After the lecture they set up some markers and did some practice drills with a chase boat close by in case someone needed some help. As with last year some of the best sailors in our group will be on hand to help you with set up and sailing questions so dont miss this clinic! ~ by Floyd on April 15, 2012.
is this may of 2012? I would love to come but I need to know where and time to be there. Please go to http://www.tcdyc.com for more info on this clinic. I think it starts at 10 am on Saturday morning.